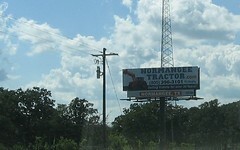 I'm too tired to do a real post, but I snapped this picture of a billboard for my grandfather's old business. It was a long way from Normangee, on the road up to College Station. Obviously business must be pretty good.